I am not claiming any skills whatsoever at model building. One of the problems here is getting an exact pentagon in this small a scale. On a building scale the structural components would come together precisely. 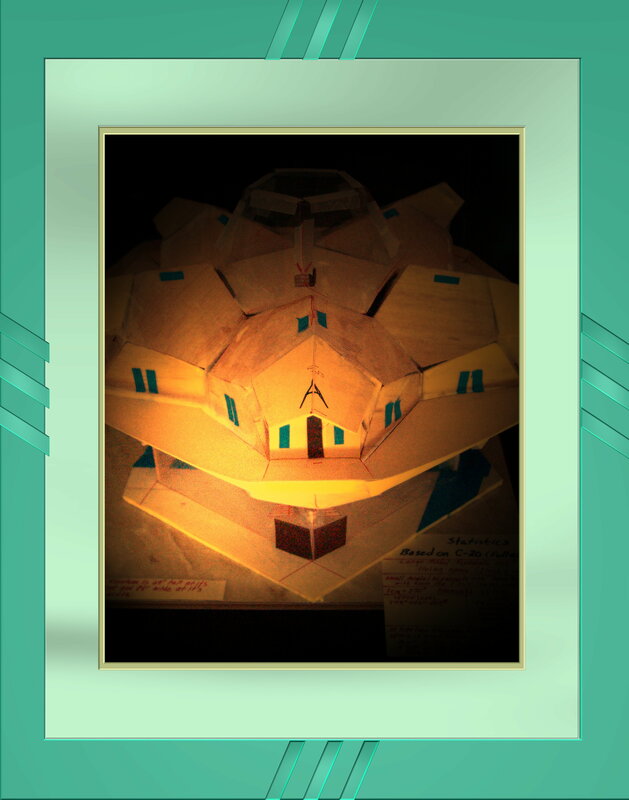 In this model Brown represents doors, blue represents windows and skylights, and black represents model cutaway areas. This structure represents one “household”. It can accommodate five to ten tenants/members/owners. The area marked ‘A’ is the ‘front’ of the structure. ‘B’ and ‘C’ are areas where the next household(s) are attached, for a maximum of five, a community (25 to 50 members). and the “Green Level” or the upper level, the spa/green house/solarium, a communal area open to members only. ® The Household is approximately 98’ wide and 64’ tall. ® The Green Level contains approximately 907 sq.ft. This amount of glass covered space open up a lot of possibilities from indoor spa/jungle to year round food production. ® The Blue Level contains approximately 3217 sq. ft. which is enough space to have a commercial sized kitchen/pantry, cook/housekeeper/repair couple apartment, medical team quarters, music room, etc. Basically whatever the members of the household decide how they want to utilize the space. ® Each Pod in the Red Level contains approximately 1656 sq. ft. of personal space. 383 sq. ft. in the loft, 740 sq. ft. on the main floor, and on the lower level 308 sq. ft. on each of the two shoulders and 225 sq. ft. in the pit. This is a lot of room, obviously too much for some people. There is no reason a pod could not be divided between two members, or be set up for a couple. ® In addition there are 84 sq. ft. of back porch (semi-private) that is covered, and 95 sq. ft. of uncovered deck on each side of that per pod. ® All together there are 6018 sq. ft. of structured space in each household. There is a very large amount of roof available for solar arrays and numerous gable points available for advanced wind turbines. Needless to say, a great deal of power can be generated within the structure itself if proper planning is done. Within the structural limitations of the modeled referenced schematic described here, there is a vast amount of individuation within each household. Both the Blue and Green Levels will be designed (interior) by the members at large. The individual pod’s interior is solely the domain of the pod owner(s). I have already seen designs for splitting a single pod into two units. In this case not because they wanted to save money as much as they did not feel that they needed nearly 1700 sq. ft. of personal space with all the communal space available. The first group of interested people are looking to build in Central America. All are retired and all are artists, musicians, writers, or some other form of the creative arts. They like the idea of the large area down stairs and have discussed caretaker quarters, onsite medical staff quarters, studio space, and entertainment space. There is room for it all. Off the grid is an important concept to each and every one. Wind/Solar/Water have been discussed along with food production, global climate changes, hurricane protection, and travel to the U.S., among other topics. Many have had experience in communal situations and are well aware of many of the pitfalls that are inherent in concept. We all feel that the first priorities are space, privacy, communication, and options.